On his long awaited new studio CD, La Kahena, the Algerian born Cheb i Sabbah returns to the roots of his native North Africa gathering some of the most distinctive female singers from the Maghreb in a studio in Morocco. With tracks by vocalists from many different traditions of North Africa, La Kahena compellingly illustrates the diversity of this region. 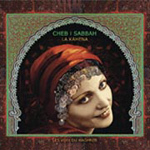 Recorded in studios in Marrakech, San Francisco, New York and New Delhi, Sabbah finished the sessions by adding his own "dj Science" or modern aural magic to these performances, making La Kahena a truly original and ground-breaking project the likes of which only the artistic vision of Cheb i Sabbah could have created. Stránka vygenerována 22.4.2019 v 23:04:12 za 0.229 sekund.